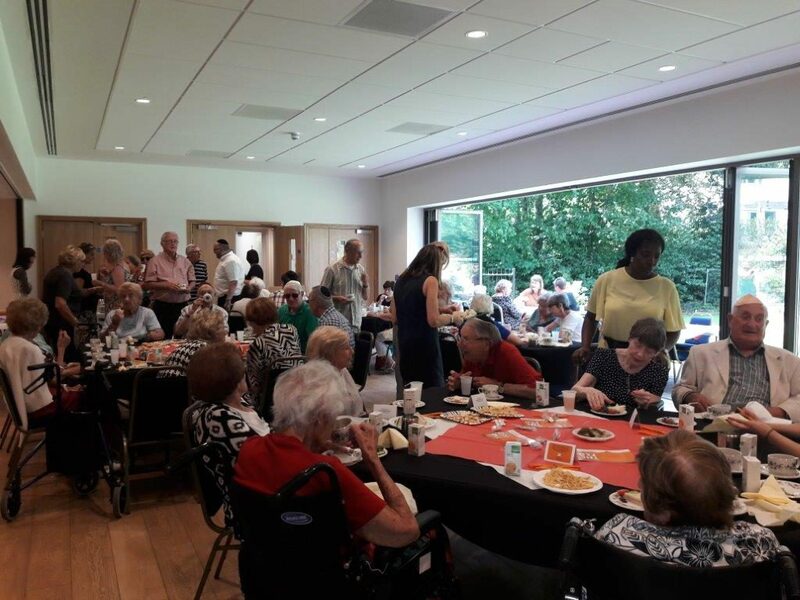 Friends old and new from across the South Manchester Jewish Community enjoyed a festive ïCoffee Stop’ on 27th September, thanks to a partnership between The Fed and Shaare Sedek Synagogue in Hale Barns. Coffee Stops are regular meet-ups run by The Fed’s Volunteering Team which bring together elderly, lonely or isolated people across the community to socialise. Crucially they aim to combat the loneliness and lack of stimulation that many people who live alone can experience, through meeting old friends and making new acquaintances. The interactions at the coffee stops – and the friendships made – can for some clients be their sole interaction with others. Hosted in the synagogue’s Succah – a temporary dwelling constructed for the week-long Jewish festival of Succot – 18 clients of The Fed were treated to an afternoon spread of pastries and scones. The event was supported by ten Fed volunteers, who offered transport to and from the synagogue, and chatted to clients throughout the afternoon. Guests were offered the opportunity to make the traditional blessing over the ïlulav’ and ïetrog’ – the willow branch and citrus fruit traditionally used for prayer during the festival – which led to a lively discussion on how to make etrog jam. The Fed’s Director of Community Services, Bernie Garner welcomed the guests, and gave a vote of thanks to Shaare Sedek Synagogue for hosting the event. Future Coffee Stops are already being prepared in north Manchester, on November 1st and December 4th, the latter being a Chanukah party. Further Coffee Stops in South Manchester are currently being planned. Anyone interested in joining a future coffee stop, or looking to volunteer with The Fed, can call our Volunteering Department on 0161 772 4800.